INSTANT MESSAGING. 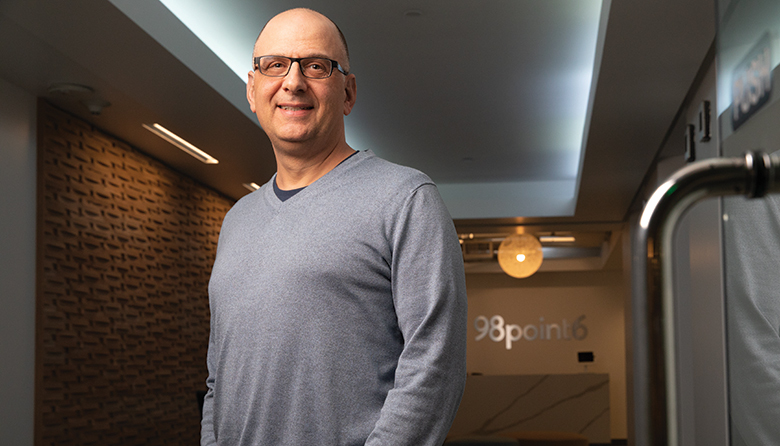 98point6 Inc.’s Robbie Cape has ambitious plans to reform the way health care is delivered. Robbie Cape isn’t focused on taking his health care startup 98point6 Inc. public. But after raising a staggering $86.3 million in four funding rounds, he’s not ruling it out, either. The company, which last fall closed a $50 million funding round led by Goldman Sachs’ Merchant Banking Division, offers on-demand text-based primary medical care through an app and website where patients can connect with a physician via their smartphones. The service has more than 100,000 members in its network and employs 136, mostly in Seattle. The vast majority of clients are businesses looking to save on health care costs and offer employees accessible primary care, but the company also provides individual options. It has some 40 corporate clients in 44 states and plans a push into international markets later this year. 98point6 — which says it wants to be the Amazon of health care — claims that it resolves 97 percent of medical conditions via its app and treats more than 200 conditions monthly. Cape has a history as a mission-driven entrepreneur. At Microsoft, he worked for years on Microsoft Money, the company’s personal-finance management software program. Immediately prior to launching 98point6, he founded Cozi Group Inc., which created a web- and app-based digital calendar to help families and individuals do everything from plan vacations and shopping lists to coordinating co-parenting. “I’m trying to build meaningful businesses that deliver great return,” says Cape, whose company’s headquarters are in downtown Seattle.